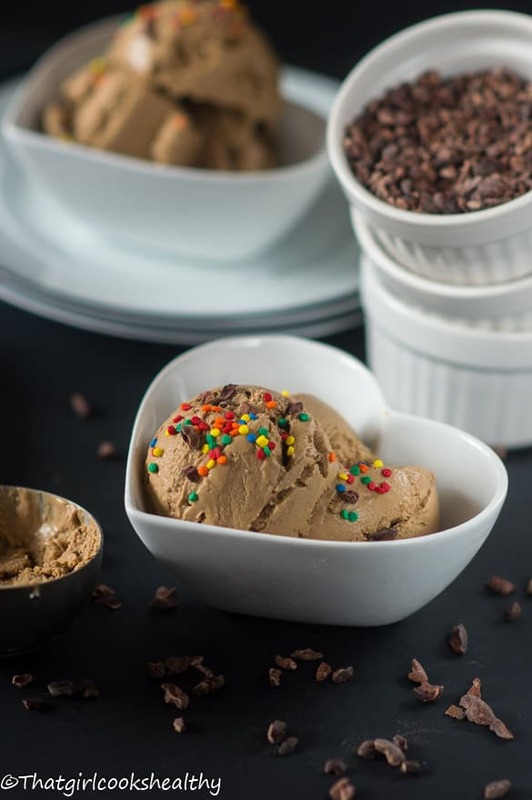 Chocolate avocado ice cream – dairy free chocolate ice cream made with avocado and coconut milk made in a food processor or ice cream maker. 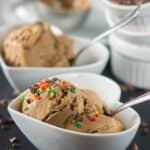 This creamy ice cream is quite easy to make and the good news is it can be made with or without churning. However you will still need either an food processor or a high speed blender (if possible) like a blendtech or vitamix to puree the base of the recipe. As mentioned before you can make this recipe without an ice cream maker. The recipe will still turn out just fine but the former will require whisking to avoid freezer burn. If you do have an ice cream make it will be a lot easier to prepare the ice cream. I would recommend dusting it off and using it instead. Nowadays I rarely purchase ice cream I would much rather enjoy making my own instead. It’s easy and incredibly effortless but it feels like a milestone has been achieved if it’s your first time doing so. In terms of what flavours one can make, absolutely ANY…though the general rule of thumb is to use milk as the base. I always whip up my ice cream with full fat coconut milk and then include whatever add-ins I see fit. In this case I made a diabetic friendly chocolate avocado ice cream for my grandmother, she likes ice cream but being afflicted with type 2 diabetes doesn’t permit consuming processed store brought ice cream. Home made ice cream allows one to enjoy their creature comforts without compromising health. Avocados are full high density lipoprotein (HDL) a type of good cholesterol that lowers the bad cholesterol which can clog our major arteries and create fatty deposits in the liver. Many people shy away from ALL type of fat in fear of developing cardiovascular disease but the true is we need fats to regulate our hormones AND to fight inflammation. Another thing, if you’re looking to gain weight in a healthy manner I would highly recommend consuming some good fats like avocados, so in a sense while this ice cream isn’t specifically made to gain weight, you can incorporate into a lifestyle where eating something more calorific needed. The additional hint of cinnamon is there to add a spicy flare and to also aid blood sugar levels (no huge spike). Recommended sweetener as always low glycemic index – coconut nectar, agave or maple syrup. 1 large avocado, ripe, pitted and skin removed. 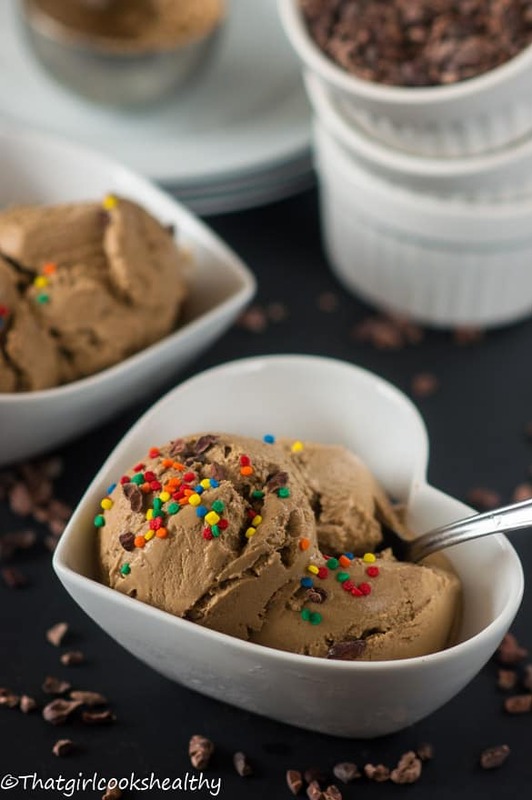 If using an ice cream maker, place the bowl in a freezer overnight for at least 4 hours before use. Place all of the ingredients in a high speed blender or food processor and blitz into a smooth consistency. 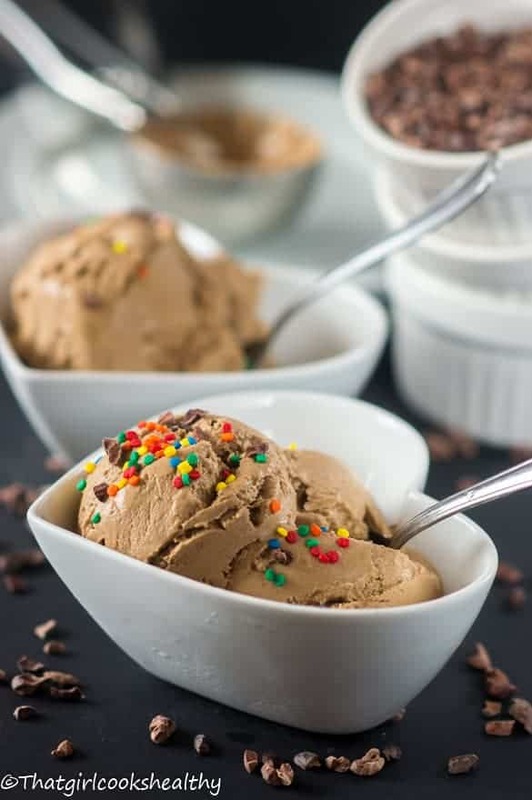 Once a smooth consistency has been achieved, prepare the ice cream maker and use accordingly to the manufacturer instructions. 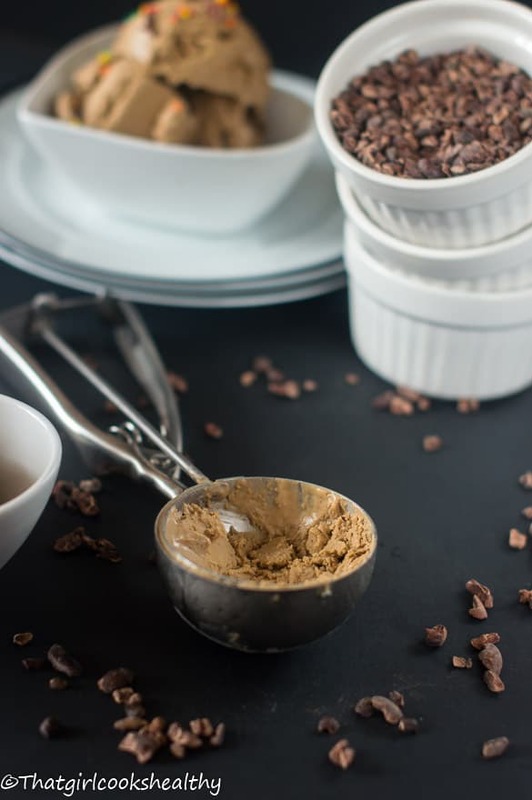 To make without a ice cream maker, once the ingredients have been blended, simply pour into a freezer friendly container and freeze for an hour. After the given time whisk the mixture every 30 minutes for up to 4 hours to omit freezer burn. Over a course of time the ice cream will thicken and then serve accordingly. I WANT THIS ALL IN MY FACE RIGHT NOW! And you know what?!?!?!?! I CAN EAT IT – THANK YOU for making such a delicious recipe that my diet will actually ALLOW ME TO EAT! Hi GiGi, you are welcome. Enjoy! Feel free to contact me if you need further assistance with any additional recipes. I got to try this ice-cream! 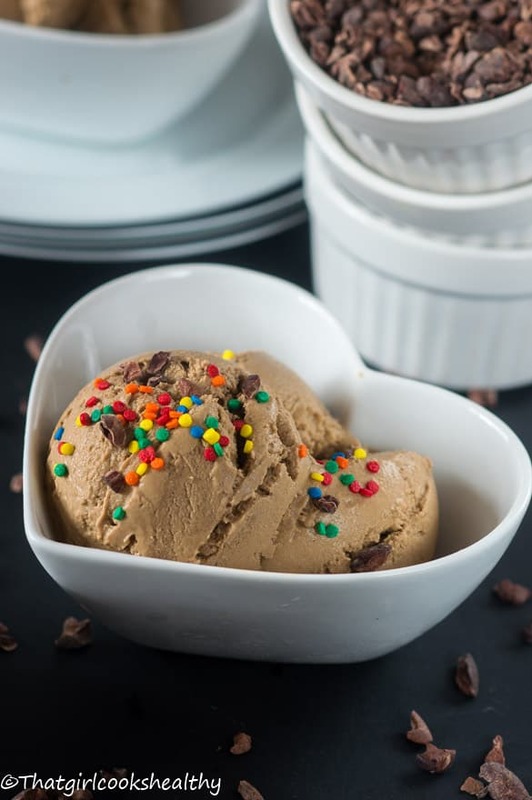 I can never say no to chocolate ice cream and I love this twist of coconut milk in it.. I love cinnamon with chocolate. And have been looking for a healthier version of store bought ice cream. Time to break out the ice cream maker! Thanks Melissa, this stuff knocks the store brought ice cream out of the water. 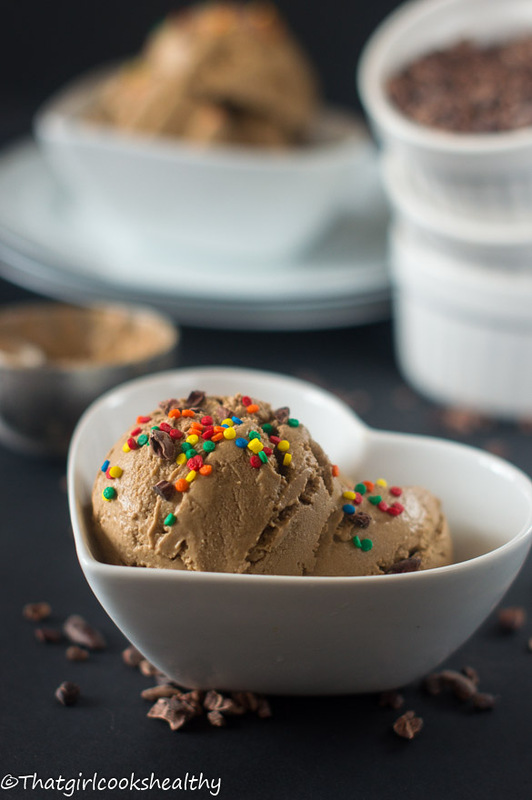 I’m craving ice cream so much lately, and I need to try making this healthy version! I love that it’s vegan and uses avocado. Pinning. And, I really need to dust off my ice cream maker…you’ve convinced me! This chocolate ice cream looks thick, creamy and dreamy, AKA everything I want ice cream to be! YAY for avocadoes! This sounds delicious. Would have never thought of making ice cream with avocados!! I really enjoy your presentation of meals throughout your site – beautiful dishes. Have you heard of Dr. Sebi? Since you are on the journey to eating healthy, I thought I might put his name in your “ear” =). Like you he’s also African. I believe he was born in one of the islands. Anyway, he focuses on the African biological make-up of his people and what we should eat for optimal health because he said he is black, first and foremost, and because the mother (Africa/the people) are sick. And, his mission is to help his people in health and life by exposing hybrid foods like garlic, yams, corn, large bananas, and other fruits (usually the ones without seeds, it seems). He touches on a lot and has been doing this since the 1960s, I believe; so decades worth of research is under his belt. Maybe it would be of some use to you. I know we are all humans, but we are still created different from one group of people (collectively) to the next. Other groups of people may benefit from his research, but his focus is the “poisoning” of his people through foods not meant to create a conducive environment for optimal health. Even though I do not agree with some of the information pushed out by the government, I don’t know how many studies really focus on the health and nutrition of the blacks or non-whites and in a positive light, at least here in the US. Whites are still given priority–in ways people don’t even see or simply ignore–everyone else is like an after-thought and made to believe it’s a universal diet when it’s really not. It’s good that someone is looking out for the complete health and nutrition of blacks by really delving into research. I hope he succeeds at his mission. Oh! How could I forget…he is the man who was taken to court back in the late 1900s for putting out there that he cured AIDS, HIV, cancer, and other said-to-be-incurable diseases and didn’t remove his ad in the paper back then when told by the authorities. To my surprise, he actually won the case in the NY Supreme Court. Anyway, enough of that. Keep up the awesome work you do, too! Take care. Hey Patricia, thank you for stopping by. Yes I have heard of Dr Sebi. I adore his teaching which promotes the alkaline lifestyle. That is something that I would like to eventually transition to. Delicious recipe. Do you think it would work well with an added banana? Thank you. No I think banana and avocado are too contrasting in taste. I doubt it would be complementary but you can always try it and let me know. Greetings, lovely recipe will give it a try, very glad to see you have heard of Dr. Sebi and his Alkalinity intake for Africans in Africa and the Diaspora especially for our overall health. I will bookmark your website. Keep the good work up. Have you tried Soursop ice cream. (Forgive me if the recipe is on your website). Thanks for the love Errol, highly appreciate it. Yes I’ve been trying to incorporate Dr Sebi’s work into my lifestyle. I hope to eventually transition to an alkaline based lifestyle, so taking small steps for now. I am working on a cookbook right now and soursop ice cream will be included. We consume a lot of soursop in the Caribbean, so had to include a recipe with it. Hi, I am going to make this right now for passover. I bet you didn’t realize what an awesome recipe this is for passover, no dairy, and looks delicious. Thanks. Yes, it’s definitely fitting for passover, enjoy Mel! !